On Monday, 14 February, the scientific publication ‘Analytical Science' released an article on the chemical colouration of paint on paintings. Under the direction of Koen Janssens (University of Antwerp), a team of scientists is engaged in examining a number of complex chemical reactions in this respect. 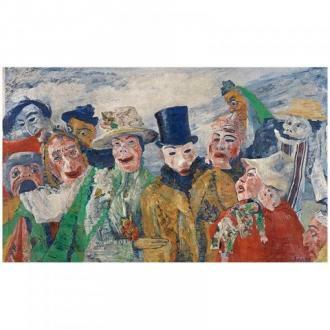 The scientists strongly propose that one of the yellow colours that James Ensor used in his works is gradually turning brown. A similar discolouration on the works of Vincent van Gogh is also noticed. This all has to do with a type of yellow that the painters used at a certain time, namely chrome yellow. This conclusion was made after paint from an old tube was placed under a UV-lamp in order to accelerate the aging process artificially. The paint from this tube of Rik Wouters, which was preserved in the Royal Museum of Fine Arts Antwerp, became discoloured in three weeks. This would become the key piece of the research project. Thanks to the ESRF particle accelerator in Grenoble, it was determined that chrome atoms of a certain chemical type were present in the brown paint, which normally were not present in the original paint. In addition, barium and sulfur were found in close proximity to the atoms. It was suspected that the origin was from barium sulfite. Barium sulfite is a colourless additive medium that is mixed with paint to dilute it. The addition causes a reduction of the paint and is, according to the researchers, certainly the source of the discolouration. Ensor used chrome yellow in his painting between 1880 and 1890. Also in his iconic work, The Intrigue (1890), darkened yellow paint elements are found. These research results can have important consequences for the preservation and maintenance conditions of paintings from the 19th Century. For, once we know how the colouration process works, measures can be taken to hinder the change. The researchers already think that a decrease of the UV-rays and a cool, dry environment can have a positive effect.